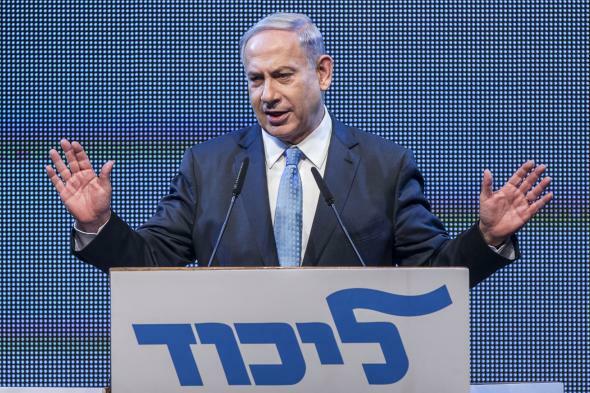 Did Netanyahu’s speech help or hurt him in Israel? Benjamin Netanyahu gives a speech during a campaign rally on Jan. 5, 2014. Back in Israel, Benjamin Netanyahu’s speech to Congress was widely viewed as a campaign stunt ahead of elections on March 17. Election authorities even ordered TV stations to air it on a five-second delay in case Netanyahu veered into “electioneering.” But based on the first poll released after the speech, it doesn’t appear to have shifted voters very much. According to the survey by the Midgam polling group, if the election were held today, Netanyahu’s Likud party would take 23 seats in the 120-seat Knesset, while a center-left alliance between the Labor and Hatnuah parties would take 24. Given Israel’s small population and large number of parties, polls are often unreliable, but this result is consistent with other recent polls, which have given the alliance, known as Zionist Union, a slight edge. However, 47 percent of voters said they believe Netanyahu is best suited to be prime minister, compared with 28 percent for the most likely of his potential replacements, Labor leader Isaac Herzog. As for the questions specifically about The Speech, 44 percent of voters said it strengthened their appreciation of the prime minister, compared with 43 percent who said it had no effect. And voters were evenly split on whether the speech was primarily intended to prevent a deal with Iran, advance Bibi’s own election prospects, or do both. More than half said it would have no effect on whether a deal was passed. The pomp of Netanyahu’s state-of-the-union-esque address in the midst of an election campaign was certainly a statement—as one Israeli television commentator put it, “There is not a single audience in Israel that would greet the prime minister that enthusiastically”—but voters are presumably already aware of his views on Iran, tense relationship with the White House, and oratorical power. So it didn’t move the dial all that much. Media reaction to the speech split predictably along ideological lines as well, with the right-leaning Jerusalem Post calling it a “fact-based proposal that has shifted the burden of persuasion to the White House” and the left-leaning Haaretz castigating Netanyahu for ignoring “the real existential threat to Israel,” the occupation of the West Bank.